If you are a regular reader of my blog, you will probably have seen the fabulous guest post by Amy Goldsmith about the uses of argan oil for skin (and if you haven’t, I highly recommend that you do give it a read!). Argan oil is a great multi-purpose product that can be used for a number of things. It can be used on the skin, on the hair, for nails or even for healing purposes. One of the brands who sell this wonder oil is InstaNatural. Their Argan Oil is a 100% pure, cold-pressed, organic, unrefined, Grade I oil that is Ecocert certified. It comes in a fairly large 120ml/4fl oz bottle with a screw cap that can be replaced with a pump cap (included). I decided to go through Amy’s tips from her article to give it a proper test in a variety of areas to let you know how well it works. I have been applying this oil to my face as a moisturiser at night times. After washing my face, I applied a couple of drops of the oil and massaged it into my skin whilst it was still wet. Upon awakening my skin has been looking pretty incredible! It has a healthy looking glow to it that doesn’t look or feel greasy at all even though I have oily skin. Another plus is that the oil is really lightweight, so it feels as if there is no product whatsoever on my face. Whilst it doesn't cause or aggravate shiny skin, the only downside is that it doesn't do anything to combat it. Therefore, if you have oily skin and prefer to use a mattifying moisturiser, you may be deterred from using this in the day time. With that said, it does make a good makeup base and it is pretty great to use over night. I applied a few drops of InstaNatural’s Argan Oil to the roots of my hair and left it to work its magic for 30 minutes before shampooing and conditioning. It took two shampoos to remove the oil, but after conditioning and drying my hair was left feeling super smooth and sleek with a healthy shine to it. The softness lasted after continued washing as well, meaning that this would be a brilliant weekly/twice weekly treatment for your tresses. In addition, you can also use a small amount of oil on dry hair to tame and add shine, but as my hair can get greasy very quickly, I tend to avoid doing those kind of things as it never works out well for me! I swapped out my regular moisturiser to try the Argan Oil and I was highly impressed with the smoothness. Skin is left with a beautiful glow and stays feeling moisturised and hydrated until your next wash. Not only that, but a little goes a long way, particularly if you warm the oil in the palms of your hands first! Upon opening up my bottle of Argan Oil, massaging it into my nails and cuticles was the first thing that I did. It takes a while to absorb around the nails, so I find it best to use it at night and not when you have a list of things to do as you could end up getting oil all over the place. However, it is so worth it. Cuticles are left looking in perfect condition and the nails feel stronger after just one use. They also look shinier and healthier - all benefits that simply get better with continued use! I have been suffering with incredibly dry hands recently, particularly around my knuckles. At the same time that I applied the oil to my nails, I also massaged it into the areas that were dry and slightly stinging. Whilst it did soften the area, the irritation was still an issue. With more uses though, the irritation steadily got better. The dry patches aren't completely gone yet, but after using the Argan Oil on them twice a day every day for the last few days, there is definitely an improvement. 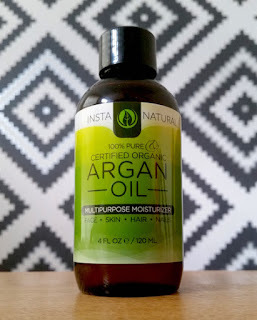 After going through Amy's uses for argan oil, I am happy to say that I have had some great success with InstaNatural's. This isn't the first argan oil that I have used, but in comparison it is fantastic. I am finding myself reaching out for it all the time for this, that or the other, so no matter who you are, I am sure that you can find a whole array of uses for this fab bottle of Argan Oil in your home. You can purchase InstaNatural's Argan Oil for £20.95/120ml from Amazon. 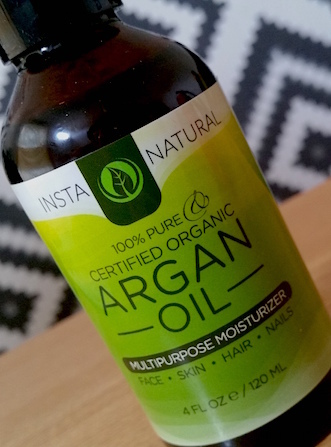 What are your thoughts on InstaNatural's Argan Oil? How do you like to use argan oil? *This product was sent to me to sample as a review consideration. However, this hasn't in any way affected my review with all thoughts and feelings about the product being 100% my own.